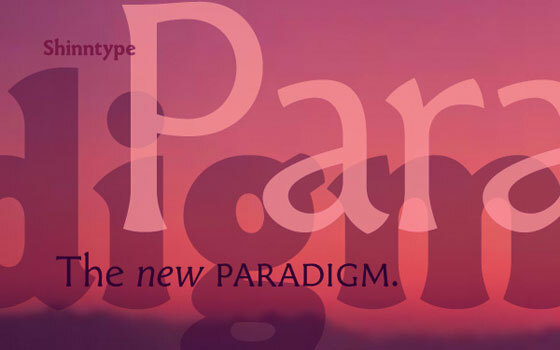 Hoplight, the first offering from Robbie Smith, is an eye-catching hybrid serif packing a calligraphic punch, released through his Smith Hands vehicle. Wonderfully crafted and very distinctive, it's quirky but stylish with it. 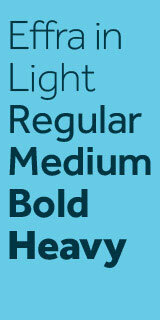 Hoplight Bold is also now available. SPECIAL OFFER: £10 off usual price, Hoplight singles now only £19 each. Grab one of these great mini collections on CD if you're in the market for a low cost quality font bundle. Available while stocks last so be quick! only £69, now reduced to £39! only £49, now reduced to £25! TYPODERMIC FONTS FROM £1 EACH!!! Prolific type designer Ray Larabie can turn his hand to practically any type style, as testified by the diversity of his Typodermic collection, a new addition to type.co.uk. A wonderful range of text and display fonts to suit even a pauper's budget, and still filled to the brim with OpenType features, alternates and autoligs. Amazing value. Fonts of this quality at this outrageously low price are exceedingly rare. 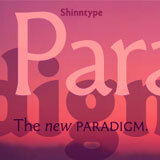 Nick Shinn's reworking of his original Paradigm now includes a Light and ExtraBold. All 7 fonts in TrueType format are only £4.99 per weight. Click here to view and buy. For those of you craving bells and whistles the OpenType Pro versions are also a steal at just £29 each.